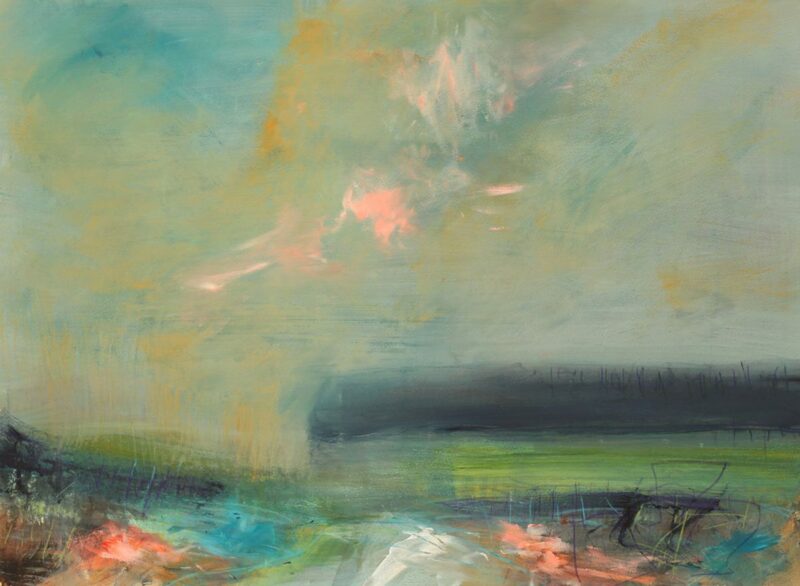 Lucy Marks is a contemporary landscape painter working in oil and watercolour. 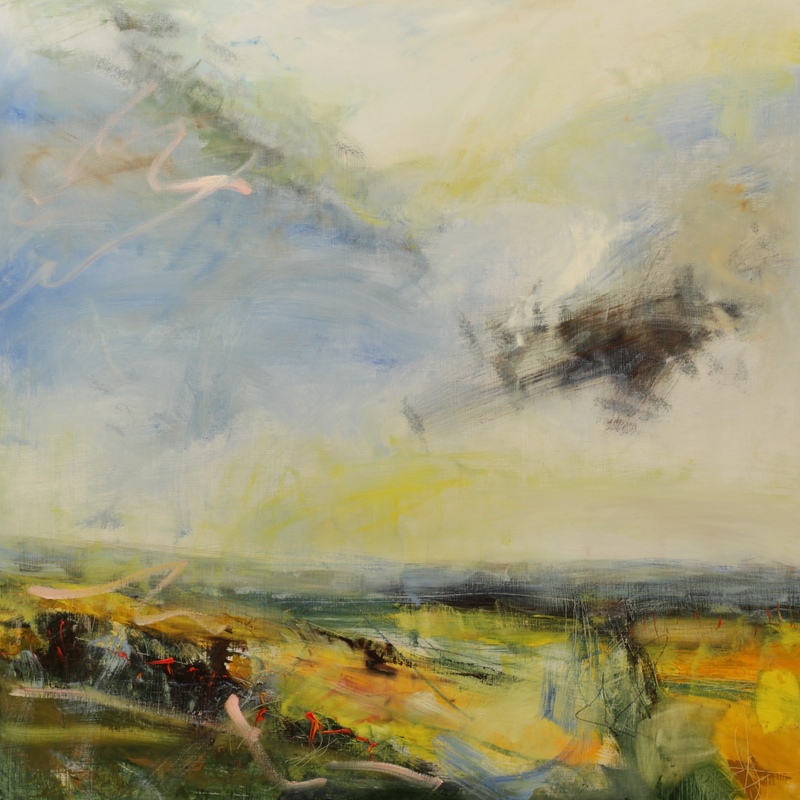 Her dynamic compositions communicate the changing energy and movement within the landscape. 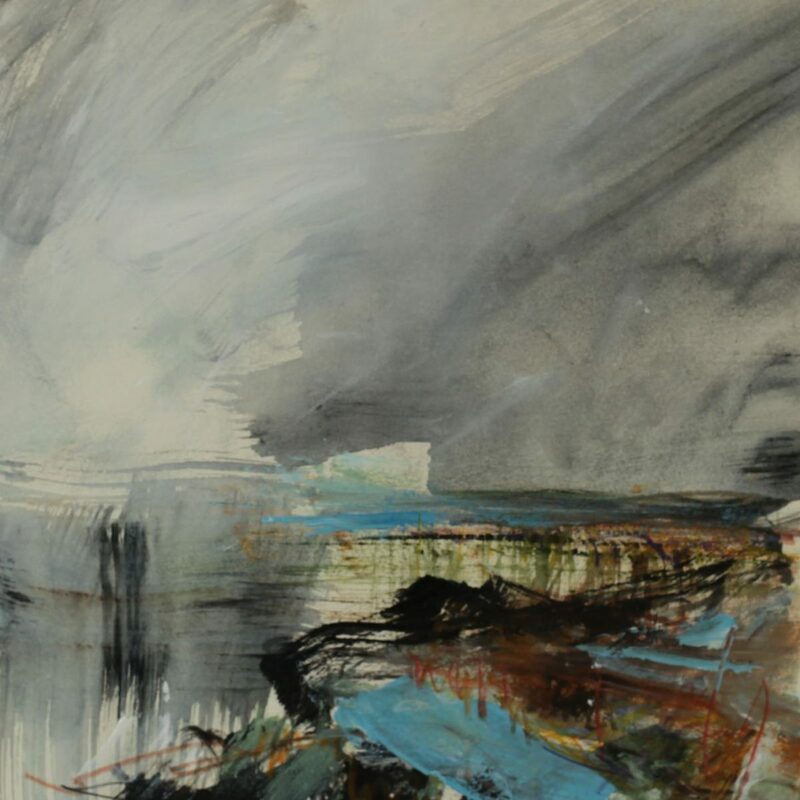 Her unique, instinctive approach captures a feeling of place through her works, creating a sensory and emotive experience which encourages an exploration of memories and subliminal perceptions of the landscape. 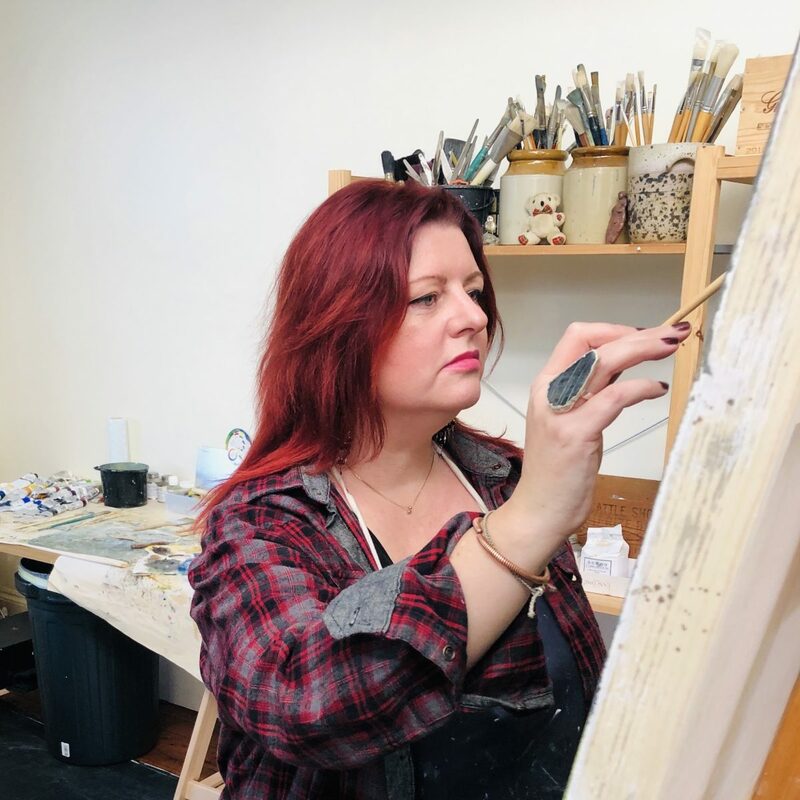 Lucy’s works are recognisable by their highly textural nature, generated through a combination of painterly mark-making, layering and the application of found materials directly onto the canvas. Lucy holds an MA in Fine Art from Brighton University and has participated in numerous group shows. 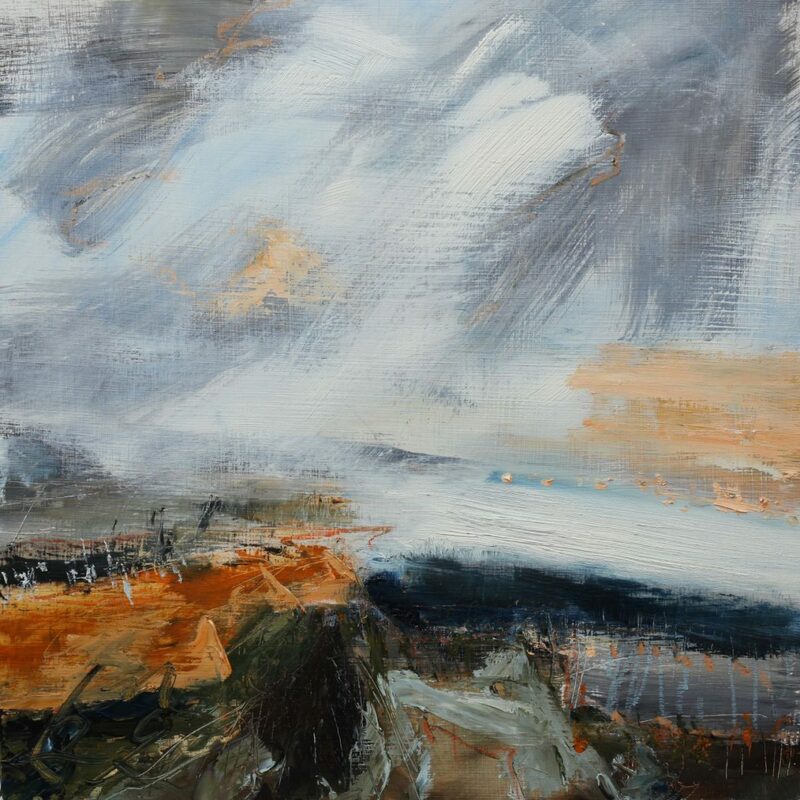 She has also won two awards through The Artist and Leisure Painter Open Exhibition, Calverton (2017, 2018). 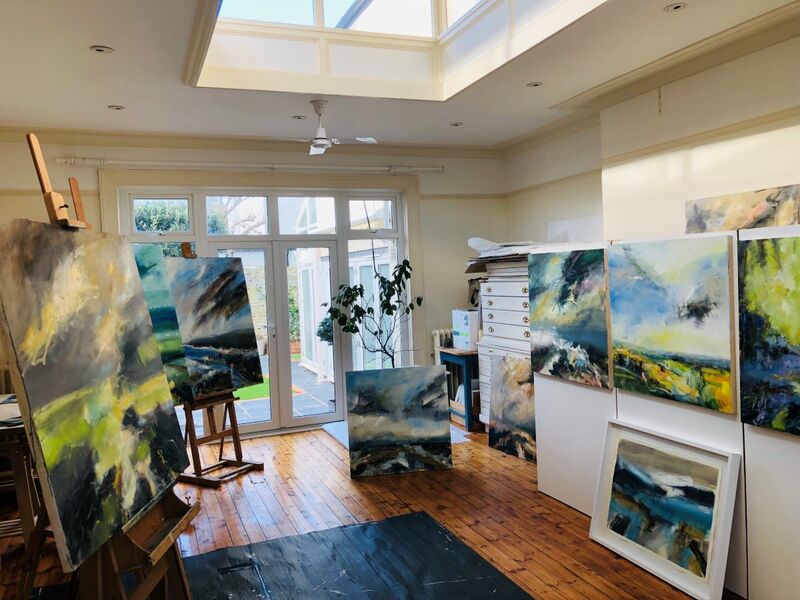 We spoke to Lucy ahead of her exhibition ‘Big Skies, Land and Sea’ at Piers Feetham Gallery, Fulham, which opens on 4 April 2019. Lucy: I hold an MA in Fine Art from Brighton University. 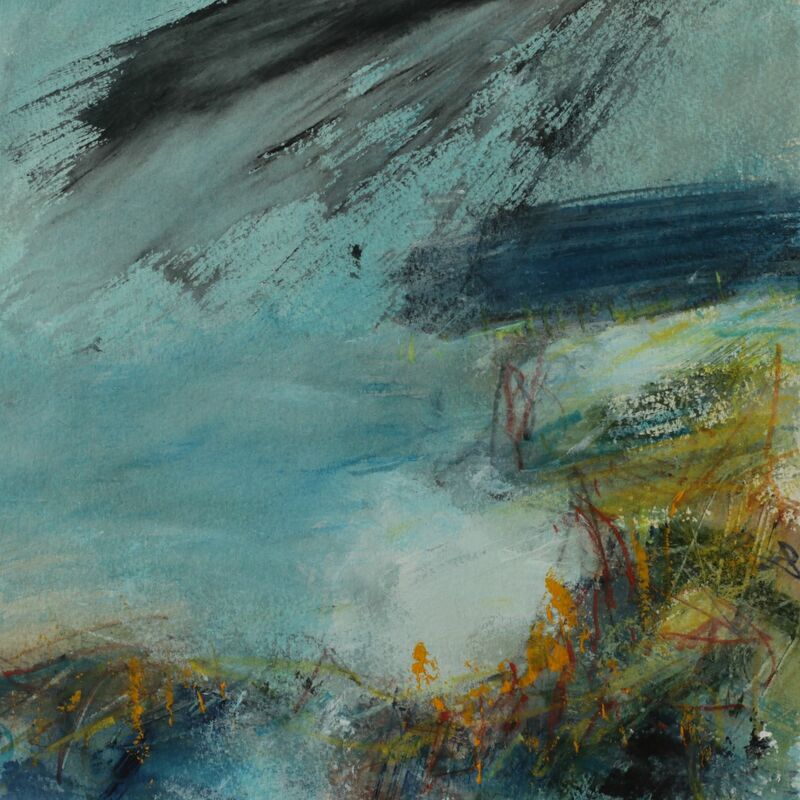 The MA process taught me to really explore ‘why I paint, what I paint’ and the meaning of my work. The MA process is the deep dive into the theory and reasons behind your work. It is very easy to keep painting without meaning. However, for work to have an intrinsic depth, it is important to have that deep understanding of ‘why’ and ‘what for’. I also grew up in a creative household. My mother was a painter and I grew up in and out of the studio while she was working. I still have her work around the house. Growing up in a creative environment, whatever it is, is a bit like doing an apprenticeship. We used to do ‘surgery’ together. This involved looking at work that wasn’t working and ‘bringing it round’. Her two mottos: ‘never be frightened of failure, it’s the beginning of something better’ and ‘put miles on the brush’ still inform my work today. I still hear her voice now when I’m painting in the studio. Daniel: How would you describe your practice? Lucy: My practice and process have evolved over the years into quite a distinct way of working. I think it’s important to have routine and rituals in art making that work for you and allow you to access the ‘flow’ of your creativity. My own process is simple and almost distilled now. However, while I do believe that a process is necessary to create authentic and strong work, it is important to challenge your process from time to time. As a painter, you evolve, and therefore as you change and mutate in your work, so must your practice. There is no point in clinging to things that are no longer relevant or don’t work. So I like to keep my process fresh and challenged. Mix it up now and then. The most important thing about a ‘practice’ is that you do it regularly. I am not one for waiting for inspiration or the muse to come and take you. Go into your studio and paint whether you feel like it or not. Then comes the good stuff. Commitment is so important in painting – as with everything in life, it isn’t about half-heartedness. It’s important not to ‘hokey-cokey’, you can’t have ‘one foot in and one foot out’. Commit, jump in and work at it. It’s not just about the fun times in the studio, it’s about working. Daniel: Why do you think it’s important that your work explores the energy and vitality of the natural world? Lucy: As a painter, the world is your oyster. You can literally choose to paint anything. Growing up in Sussex, between the sea and the Downs, the elements of the natural world almost became intrinsic to me like DNA. I grew up in a family that walked outside a huge amount. We would explore the Downs, high paths, woodlands, as much as we would take sea walks in all weathers. This, and the energy I felt driving the ever-changing landscape, taught me a huge amount of respect for the energy of the natural world. For me, capturing this energy and the mood of a place is important to honour today’s natural world. I believe we forget to ‘stand and stare’ as we go about our everyday lives, and the connection back to nature is more and more important. The energy of the land connects us to who we are as individuals and humans. Painting in a representational way connects with my interpretation of the work of Sartre, which leads into your next question. Daniel: I am particularly fascinated by your interest in Sartre, ‘irreal’ content and how this relates to the aesthetic appreciation of art. Could you expand upon this? Lucy: For me the appreciation of art is about the viewer’s experience. We live in an image-saturated world where we are constantly bombarded with an inordinate number of images of all subjects and for all manner of purposes. And so, I think painting fills a different and important gap. We no longer need it to represent a place, a thing, a person; the constant flow of photographic images does that through social media. Painting does not have to have a ‘real’ effect. There is the ‘rational’ world where we can view things factually, actually representationally. And there is the ‘trans-rational world’, the world where things are felt, may not make sense, are creative and emotive. We have moved into a time where painting is about the experience and the viewer’s experience and what we connect to when we view a work. For me it is not important to represent or recreate a ‘scene’ but for the work to have captured a sense of mood that links the viewer to a memory or time, in their world experience. Painting is about the painter and the viewer. Daniel: You’ve spoken about capturing the ‘experience’ of a landscape. How valuable is experience to you – both as a motif in and out of your work. Lucy: We all experience the world in different ways. We all have our own ‘map and view of the world’. Experience is in many ways intrinsic to who we are as individuals. In the same way no one person will experience the same landscape in the same way. Even if we stand on the same spot together and look at the same view we will still interpret it differently. I aim to capture the mood of the place on the day. And then hopefully the viewer will pick up on that energy and translate it into their ‘own map of the world’. I aim to create landscapes that capture the mood of the landscape, and I do this by walking a line towards abstraction but never tipping over into it. I personally don’t like labels, they are the start of so many issues, both in painting and outside of it. However, if I were to label, I would say that I want my work to push abstract boundaries. 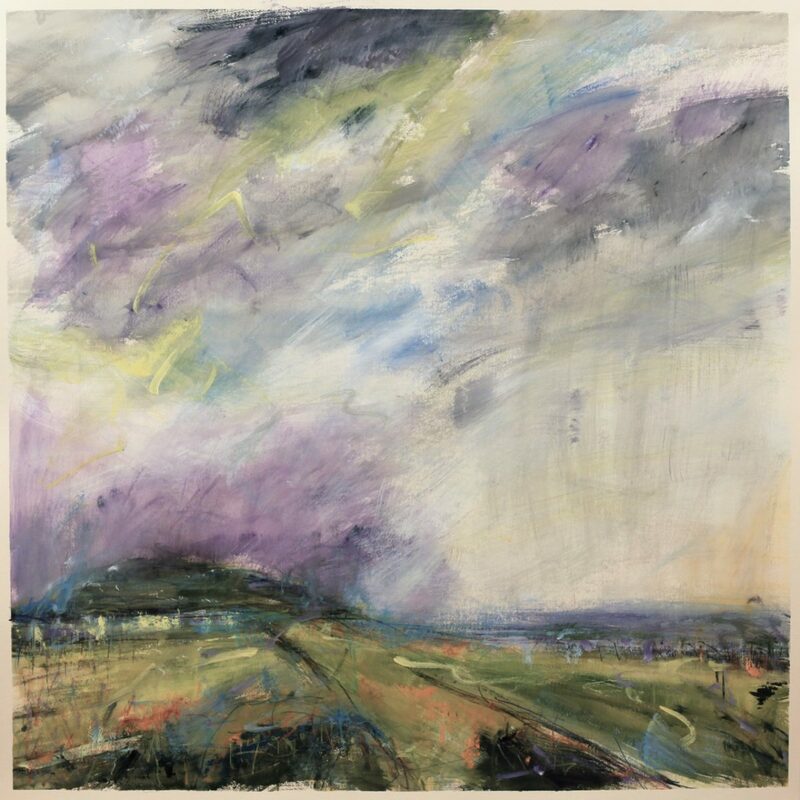 This allows the viewer to connect to their own sense of self and experiences of landscapes in their head, and not be caught up looking at a person, house, bridge, thing, that can limit them to something specific. Daniel: To what extent does this desire feed into your actual process for creating a painting? What do you want your work to convey to your audience? Lucy: It’s tricky to get caught up in what you want to convey to your audience. Everyone views things differently. That is the beauty of painting and life. So I don’t presume to convey anything specific to my audience. I would like them to have a connection and an experience when they view my work. What their experience is when they view my work is not something I’m in charge of. Each individual will have their own response. As a painter, you have a deep relationship with your work while you create it, and at some point it takes on its own life. Then it goes out into the world, you have to emotionally let go and you cannot choose what happens to it from then on. You just cross your fingers and hope that you did a good job and that people connect in positive ways to the experience. Daniel: The method of your work seems very instinctual. Could you describe your process for making artwork? Lucy:My process always starts off in an actual landscape. I draw, sketch and paint in the environment. I never take photographs of the scene as I find these limiting. I prefer to use my memory. As I seek to create moods and energies rather than actual representations, I find photographs really hold me back to connecting back to the memory. I’m not interested in that there was a house or particular tree in the landscape. I’m interested in painting the vitality of the place. Then I use these drawings, sketches, paintings back in the studio as my primary source to work up larger, more abstracted works. If I were to be too literal in the painting of what I have seen – from a photograph – I risk falling into the very trap my painting seeks to avoid; that of being representational. 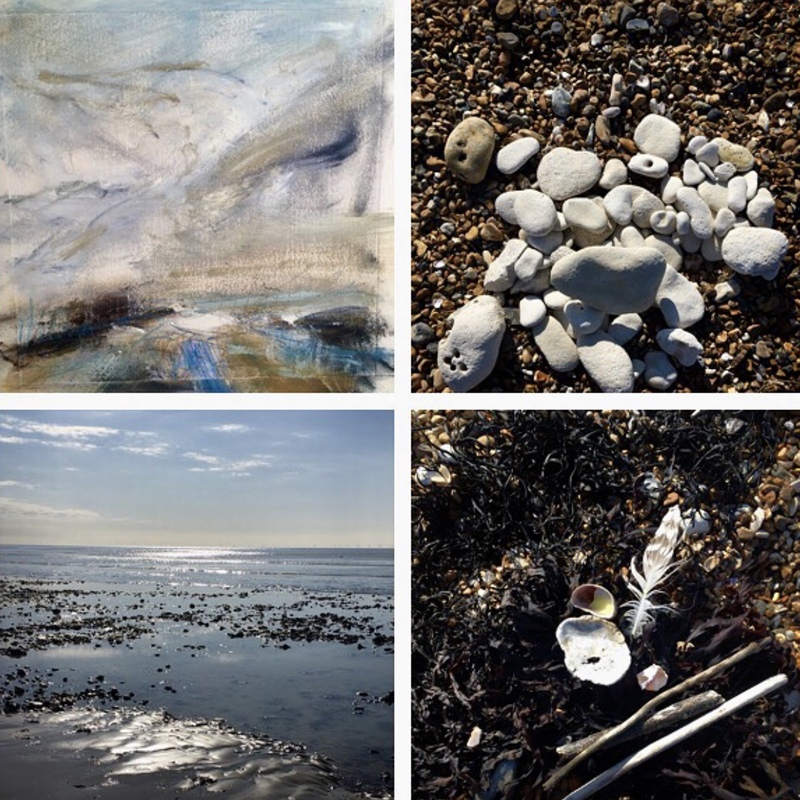 Example of Lucy’s ‘Place Palette’ – a physical snapshot of the environment she is painting. Daniel: Your website says you use raw materials in your work. What does that mean and what has led you to work in this way? Lucy: The raw materials get used in different ways. When I go out and draw, sketch, paint my initial source material, I often find stones, grasses, sticks, bits of earth, and bring them back to the studio. These will usually be used in mark-making on the works. One key thing I often do is create a ‘place palette’ – a sort of snapshot of what is around on the day. By this I mean the small stuff: grass, stone, earth, twigs. I gather these small pieces together and they give a beautiful view of the moment in time in that place. The power of small often connects you back to the big vistas. You can visit the same landscape on different days and as the flora and fauna or sea edge changes, so does the place palette. Sometimes I leave them in situ like a little offering back to celebrate nature. Other times, I gather them up and they are used back in the studio. I have been known to use sticks to mark-make, and even occasionally water to mix my watercolours. However, this is not a rule but instead provides a direct connection between the earth and the painting when I do decide to do it. Lucy Marks at work in the studio. Daniel: Do you have any favourite paints, mediums or brushes? Lucy: Well I’m faddy. I have favourites of the moment. Some of my paints and implements are expensive, as I love a good quality pigment. Other times, that cheapie you found in the bargain bucket is just the best thing. I do get obsessions. I love to create different mediums and at the moment am using different Walnut oils to see the different effects on paints. I also have a current ‘thing’ for tins of watercolour crayons. Who isn’t seduced by a tin of crayons? I read recently that Armani was so obsessed with tins of crayons that he had them put under glass coffee tables all round the house. And I think it was Kubrick who was obsessed with stationary. It’s so understandable – who doesn’t love to go and walk the isles of a good quality art shop? Just seeing all those materials and paints all lined up in colours on the racks – all that fresh promise of new work just there. I like my paint to be thick and buttery, so when it mixes with mediums it flows and glows like jewels. I go for the thick oils, Michael Harding, Old Holland, Charvin (if i can get them), mixed with a variety of Winsor & Newton and Jackson’s. With watercolour I like to work direct from the tube and I am eclectic with them. Lukas are a favourite. I often order online from Jackson’s and even though you know what’s in the boxes when they arrive at the door, the thrill of opening a newly ordered art supplies box beats anything. Such a seductive habit. Daniel: When you are working – music, radio 4, audiobook or silence? Lucy: I paint in silence. I like to connect with my work. Someone asked me recently if I notice the silence when I’m working, and I don’t. I tend to be thinking so much that the time flies. I do have the furry studio assistants (two cats and a chihuahua!) with me in the studio when I paint so I often hear a snore! I have a glass atrium roof in my studio and my resident seagull who was born there last year sits and looks at me over the windowsill. It’s all go. Lucy: Well here’s that word again ‘favourites’. I think I would prefer to say ‘heroes’ and I have many heroes that have influenced me and I take inspiration from. We are spoilt for choice in the UK as we have a wonderful and deep art landscape history with some big hitters. 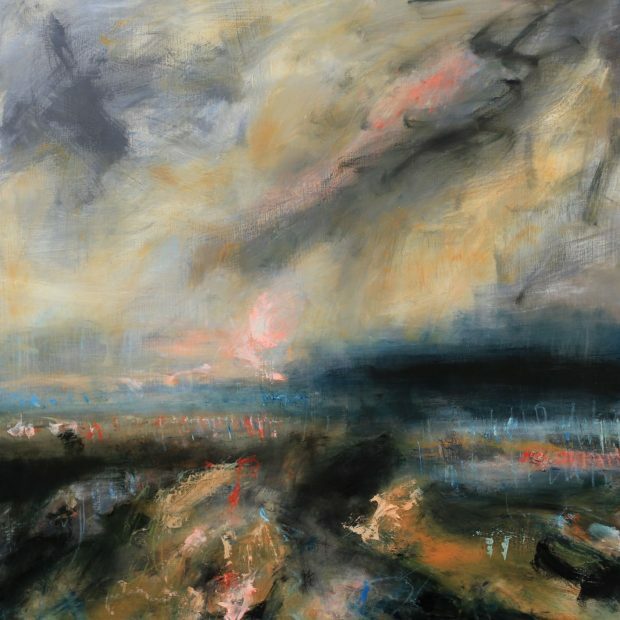 However for me there are current heroes – Auerbach, Le Brun, Hughie O’Donoghue. Looking abroad the Bay Artists such as Kuhlman have been a huge influence. I go to see anything and everything. Good art dwells in surprising places. I have patches where I will go to all the shows, and times when I like to not see too many influences. Seeing shows is fantastic and you grow, however, there comes a time when it should just be you, being you, in the studio. I think authentic work comes from really knowing what you are doing, why you are doing it and then going and working at it whether you feel like it or not. Sometimes if you see too many influences, it’s like too many voices and you need to be your own person and paint your own voice. Work from Lucy’s upcoming exhibition at the Piers Feetham Gallery. Daniel: Can you tell us about your upcoming exhibition, ‘Big Skies, Land and Sea’? What else can we expect to see from you in the near future? Lucy: I am very excited about my upcoming solo show at the Piers Feetham Gallery, Fulham, London, 4th April – 4th May. It will be first full ‘solo’ show. The show will have a large body of current work, both Oil and Watercolour. 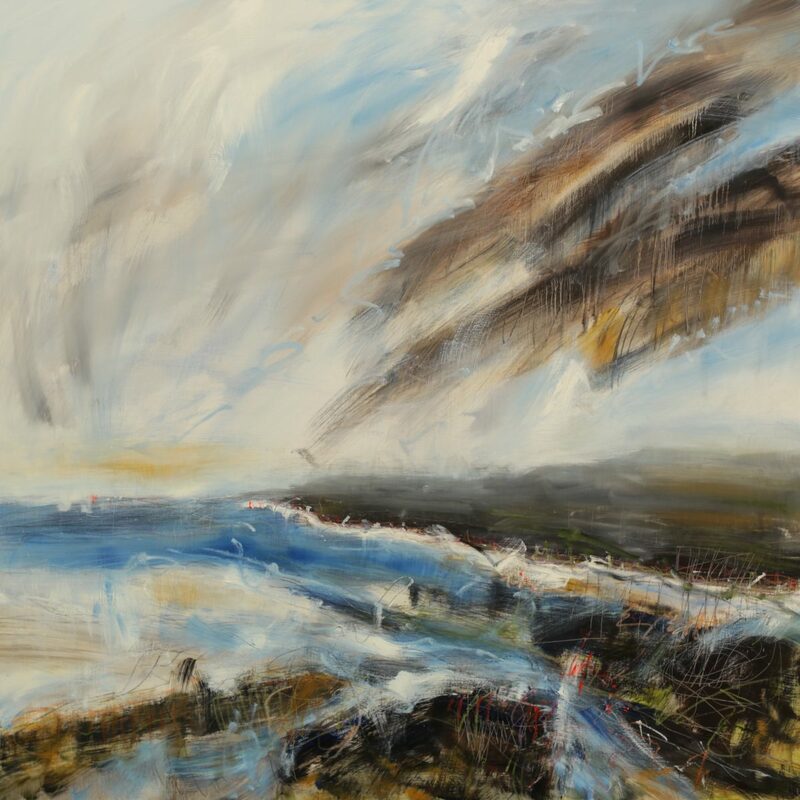 The works capture the energy of land and sea in Sussex and will range from small (30 x 30 cm Oils and Watercolours) to large (over 1 m in both Oils and Watercolours). The title of the exhibition really reflects what paintings will be on show. I was keen that the title of the show does what it says on the tin and is an exhibition of my work that focuses on the energies of the natural world. The Piers Feetham Gallery is a beautiful and airy space with fantastic light, so I can’t wait to see all the work hanging together. Piers is wonderful at curation, which is a skill in itself, and together we have been working on the flow of the work in the gallery space. We started some time ago, looking at the body of work in my studio and carefully selecting and curating as we went. The show will take the viewer through a journey of nature in the seasons. As for what’s next – starting a new series of work, back to the studio. 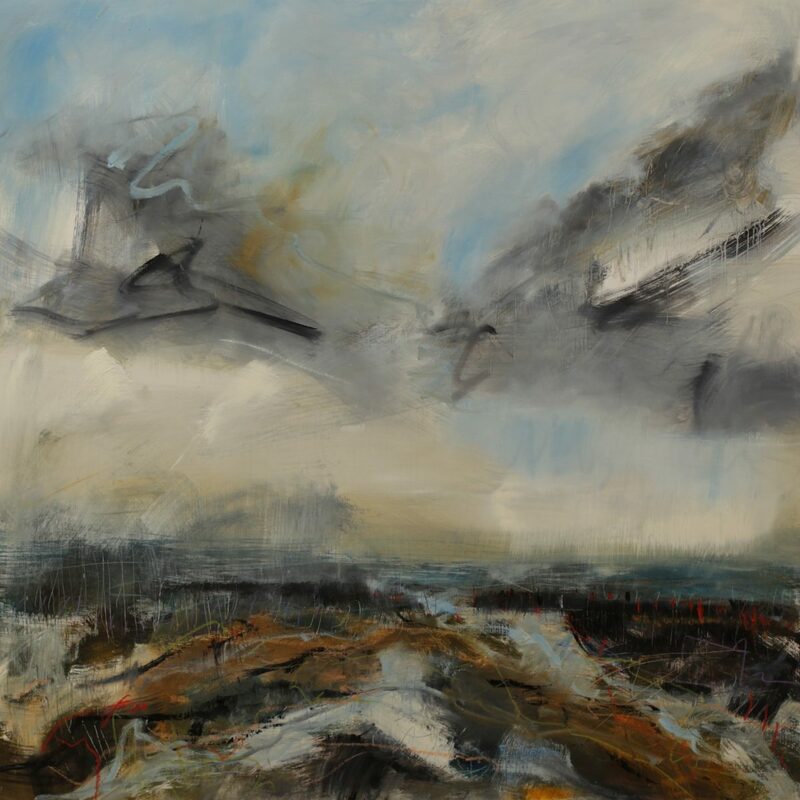 Lucy Marks’ upcoming exhibition ‘Big Skies, Land and Sea’ will run from 4 April – 4 May 2019 at the Piers Feetham Gallery, Fulham, London. You can keep up to date with Lucy’s work on her website, Instagram, Twitter and Facebook.